We have known for a while that plastic debris ends up in the ocean. Recent studies have shown just how severe plastic pollution in the ocean has become. Each year, 8 million tons of plastic waste is dumped into the ocean, which is equivalent to 15 large garbage bags for every 3 feet of coastline. A major component of plastic pollution is made up of microplastics, which are barely visible (<5 mm in diameter) plastic fragments. Microplastics may originate from the breakdown of larger plastic items or enter with sewage runoff as microbeads from cosmetics or bath products. Microplastics are everywhere in the ocean – they are found in extreme environments (i.e. within Arctic sea ice and deep water habitats) and can be ingested by a wide range of marine organisms such as mussels, whales and even corals! It should be no surprise that microplastic ingestion is beginning to show up at the base of marine food webs as well. Zooplankton, which are tiny crustaceans like krill and copepods, indirectly eat plastic particles they encounter in the water column. Zooplankton cannot “hand-pick” their food (i.e. phytoplankton cells). Instead, zooplankton use their external appendages to create a current, filter large amounts of water and bring prey to their mouths. With this feeding method, zooplankton might easily mistake a piece of plastic for plankton, particularly if they are of similar size. One group of researchers set out to identify how often zooplankton make this mistake and what the ramifications might be. Zooplankton samples were collected from vertical net tows at four locations off the coast of British Columbia (Fig. 1). Two types of zooplankton were picked out of the samples: the copepod Neocalanus cristatus and the krill Euphausia pacifica (Fig 2.). These zooplankton were chosen based on their high abundance in the North Pacific and because they are filter feeders that are potentially capable of ingesting microplastics. To count microplastics ingested by zooplankton, individuals were dissolved in nitric acid for 30 minutes or until all body tissue was digested. Any microplastics remaining after digestion were counted and sized. 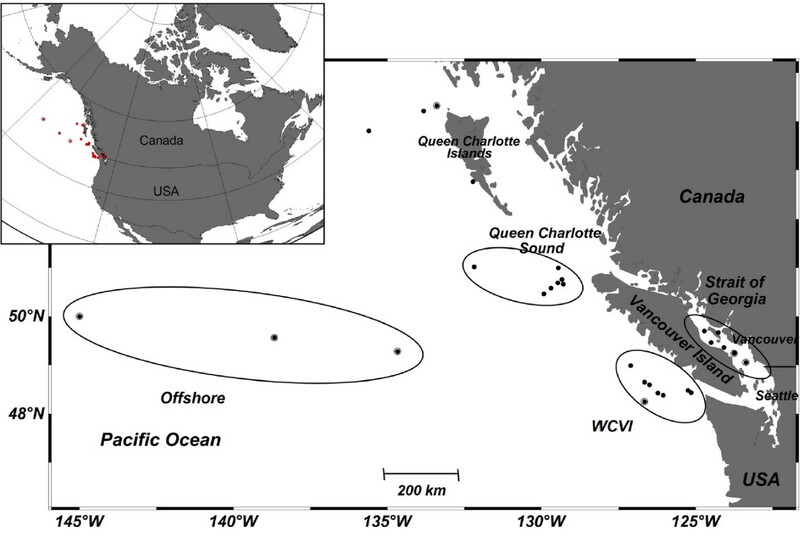 Figure 1: Zooplankton were collected from four major regions (circled) of coastal British Columbia. Both species of zooplankton ingested microplastics! This marks the first confirmed report of zooplankton eating microplastics. How often do they eat microplastics? Microplastics were found in 1 in every 34 copepods and 1 in every 17 krill, indicating krill were more prone to plastic consumption. 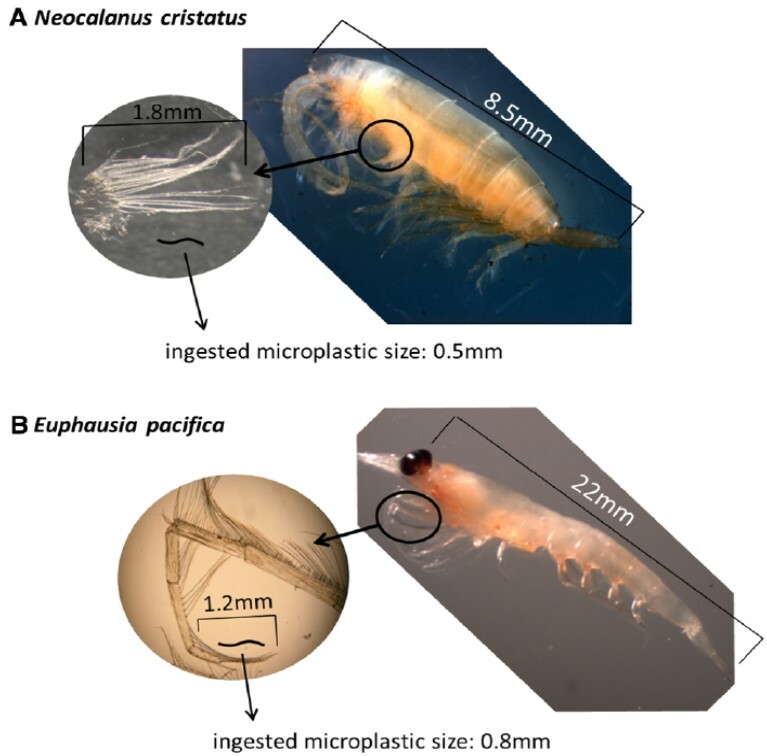 The slightly larger krill species ate bigger plastic particles, though all microplastics ranged in length from 0.4 to 0.9 mm (Fig. 2). In the study region of British Columbia, ingested microplastics were more commonly found closer to the coastline, likely because of higher concentrations of sewage and plastic waste runoff near the industrialized coast. Figure 2: N. cristatus (A) and the larger E. pacifica (B) with a close-up of their feeding appendages. The average microplastic particle size detected in this study is shown in relation to feeding appendages for both species. There are over 35,000 tons of microplastics floating in our oceans, and we are just starting to understand the consequence these tiny plastic particles have on marine ecosystems. More and more marine species have been discovered to ingest microplastics. Now zooplankton can also be added to this list. Zooplankton are suspension filter feeders that target phytoplankton prey of a certain size, which unfortunately overlaps in size with microplastics. Unable to distinguish similar particle sizes, zooplankton can mistakenly ingest plastics (check out the stunning video below). Though clearly capable of ingesting microplastic, it remains unclear how this behavior will impact zooplankton health. Microplastics may block the digestive track of zooplankton, lead to inflammatory responses or decrease reproductive success – further research is needed. What is more worrisome is the potential impact microplastics may have on marine organisms further up the food web. Zooplankton represent a critical energy source in the world’s oceans and are heavily preyed upon by fish and marine mammals. Microplastic particles can act like magnets for chemicals in the ocean, absorbing harmful substances which can make them toxic. When larger animals ingest microplastic-containing zooplankton, they may suffer from ingesting these toxins. This study brings up the potential threat microplastic consumption poses for salmon in the North Pacific. It was estimated that salmon in this region are ingesting microplastic-containing zooplankton at high levels. That means that this popular fish is ingesting large portions of toxins via their indirect ingestion of plastic particles. This could negatively impact the growth and health of salmon in the region. The ingestion of toxic chemicals and microplastics by predators such as salmon, also means that eventually these plastics and chemicals that we have dumped into our environment will make it onto our dinner table. Plastic pollution is a major issue harming our oceans, but there are things we can do to help. Here are some small steps you can take to cut down on your plastic use and help protect our oceans. Reduce your plastic consumption: bring your own reusable bag to the grocery store and use reusable products, such as water bottles, rather than constantly using single-use plastic products. Check ingredients in your cosmetics and body products and avoid any that use microbeads (more on microbeads). Recycle plastic products as often as you can. Volunteer for local beach clean ups or just pick up litter you find outside. If everyone does their part we can cut down on the amount of plastic that enters the ocean and reduce the ingestion of microplastics by marine organisms. It may seem like an immense task, but even these small steps can help to clean up our oceans. We all know that pollution is a big problem, but microplastics can cause a bigger problem for the ecosystems around us. When plastics in the wild break down, they form microplastics. Microplastics are the same size as the food that plankton eat. Zooplankton cannot handpick their foods, they are filter feeders, so they take in whatever is the correct size. Even after many experiments, it is unclear how the plankton is affected. Its effects on the ecosystem might be more tragic, however, because the microplastics that the plankton ingest act as magnets for chemicals and toxins in the ocean water. Even though it doesn’t seem as though the toxins affect the plankton, the toxins will affect the organisms that eat the plankton, but you can reduce these effects by watching your plastic consumption and make sure you use soaps and other products that don’t contain microbeads. My first question for this article would be, how is it possible that the plankton does not realize that they are ingesting microplastics, especially when they are not able to get nutrients from it? Secondly, how would scientists analyze if the plankton’s health is being dangerously affected by the plastics? Overall, the article is very self-explanatory, and it teaches us a lot about the unknown effects of our pollution. What a great article. You should post that video on social media. I think most people finally get the danger of plastic bags. But microbeads is not something that has been talked about much. Who knew?